Beautiful. I want to wear that with my beige suit & beige silk blouse! No doubt there’s a special someone you’re passionate about who has your heart. 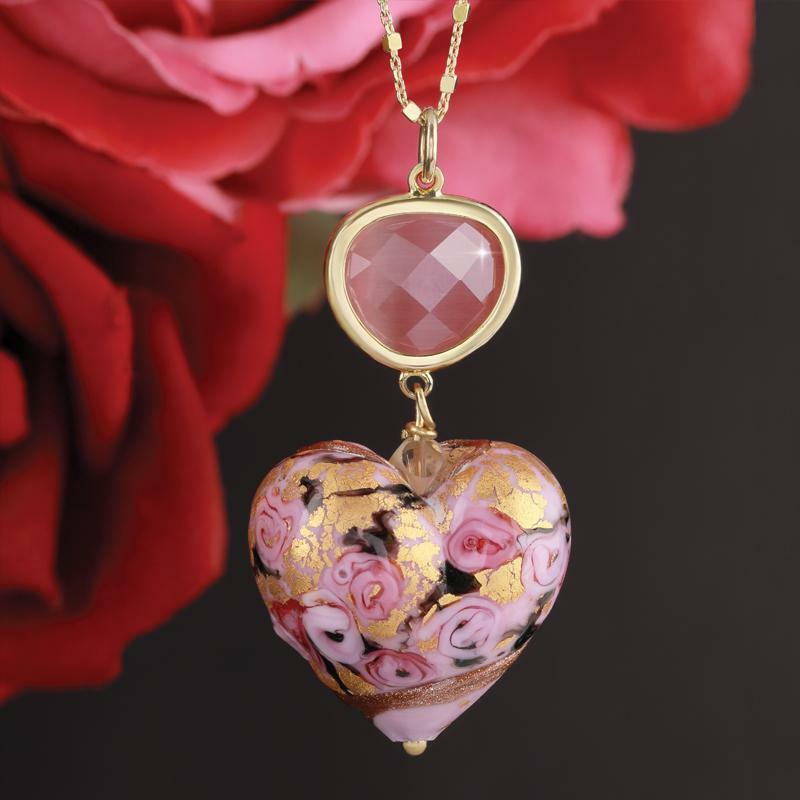 If you want to make her heart melt, look no further than the Tesoro Murano Collection–– genuine Murano glass made by hand with passion and love from the heart of Italy. The fires on the tiny Venetian island of Murano have been burning since the year 1291, producing timelessly beautiful pieces using techniques at which the rest of the world can only guess. One of the secrets of their continued success is their passion and dedication to this legendary artform. The creator of the Tesoro Murano Collection is truly passionate about her craft and it shows. Here, Manuela Zanvettori has transformed glass into art, working solely with original Murano glass canes produced on the island, Manuela forms each heart by hand. Using an age-old technique, she creates swirling rosebuds amid golden and bronze flourishes within the interior walls. 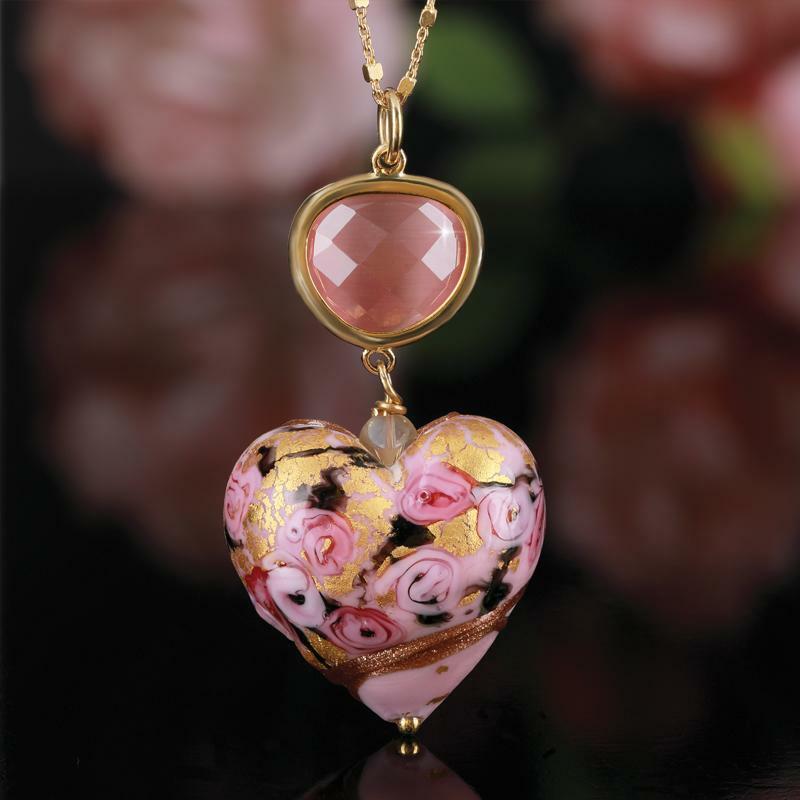 For the finishing touch, she secures each heart beneath beautifully-faceted pink crystals. The Tesoro Murano Collection embodies the heart and soul of true craftsmanship. Trust us, she will fall in love with you all over again when you surprise her with a piece of this Italian artisan jewelry. And, if you really want to make her heart skip a beat, present her with the complete collection. Please note, each handmade Murano heart may vary slightly in color and pattern.